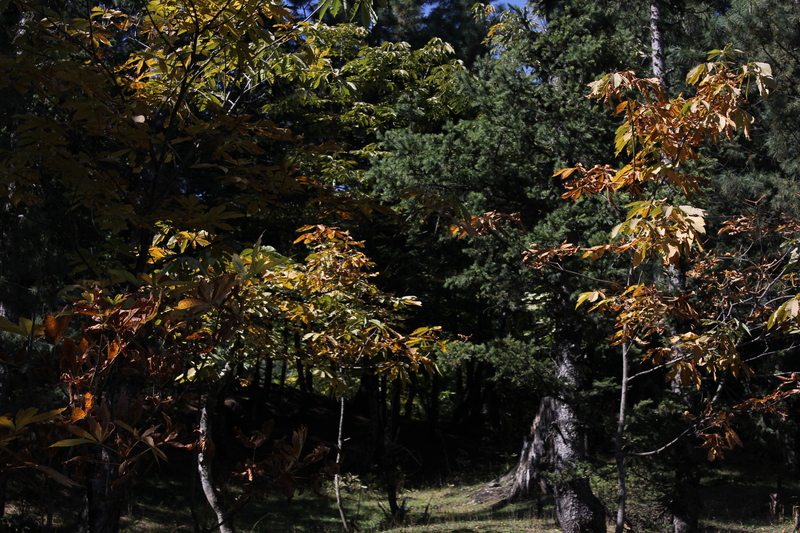 Autumn leaves changing colours to fiery red , sunset orange and various shades of dappled yellow before they fell off their perches on the branches to pile up in heaps on the ground below, turn brown and disintegrate in a process of slow demise. In India, this could be witnessed only in Kashmir, they all said. 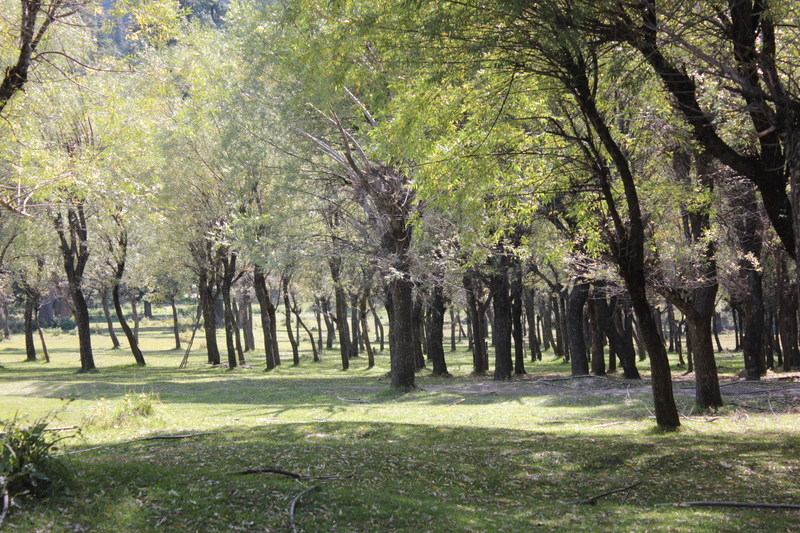 There were hundreds of “Chinar” trees there , most of them much over hundred years old. So there it was that I longed to go to see Nature’s brush at work on the foliage. 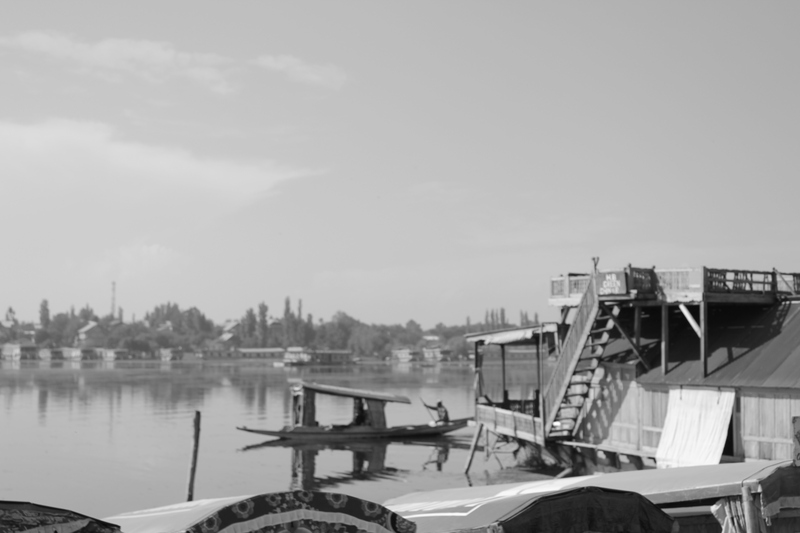 Kashmir has always been a long dreamed of destination even otherwise, but it had taken all these years for it to extend a concrete invitation to me. All places have secret strings , I feel, with which they pull us towards them. I’d always felt the tug and now it was strong enough to make me walk into its welcoming arms. Well..not exactly walk. 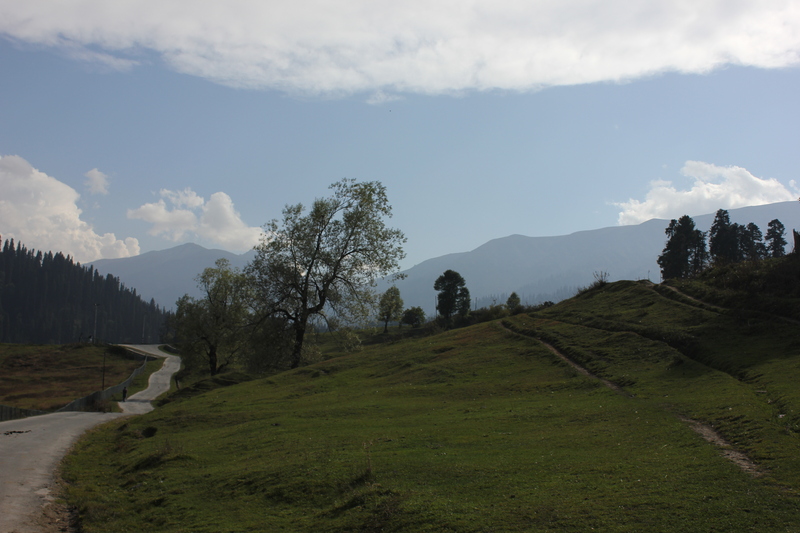 After the train journey from Delhi to Udhampur, it took us an excruciatingly slow stretch by road to get to Srinagar. At every turn there would be a flock of sheep , hundreds of them, with one or two shepherds trying to keep them on one side of the road. These were the Gujjars , we were told. 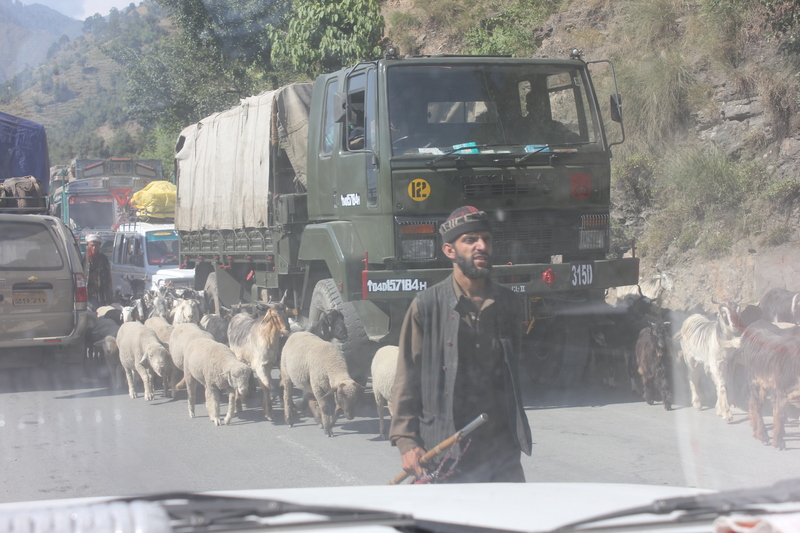 With Winter approaching , they were now escorting their flock from the upper reaches which would become unbearably cold and devoid of pasture, to warmer places like Rajouri etc. They would return to the mountains in Summer , when the meadows would become green again with fresh grass after the blankets of snow disappeared with the rays of the sun getting warmer. With the road blocks caused by the bleating woollen groups, it took us well over twelve hours instead of the normal travel time of eight hours. There is no other route by road , except this one and any obstruction in passage, weighs heavily on time and business . The long lines of trucks inching themselves up and down the slopes were epitomes of patience. Yet, it is only in the past couple of years that work on alternative routes has been taken up by the Government. After a night’s rest we were ready to explore Kashmir. 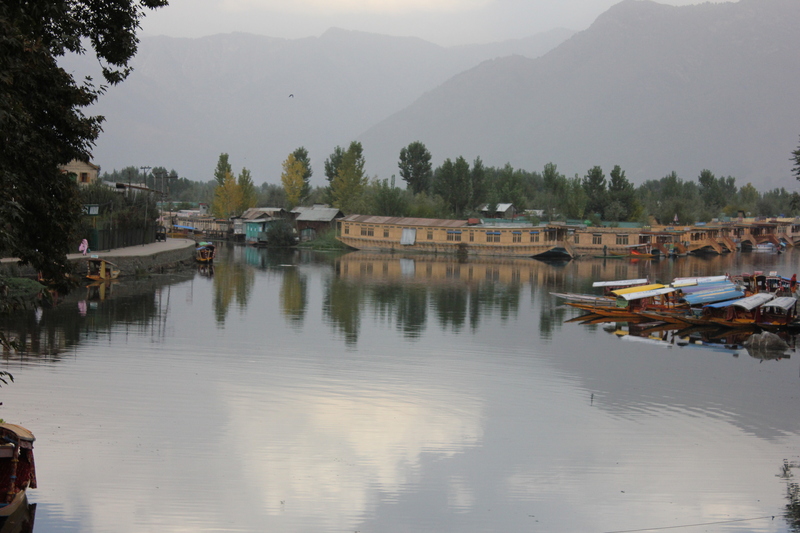 There are lots of places you can visit , basing yourself at Srinagar apart from the almost mandatory shikara ride in the Dal Lake. The Lake is huge, but the stretch that tourists are generally ushered to is dirty and overcrowded with the canoes and houseboats , jostling against each other to give one any sense of its placidity or beauty. 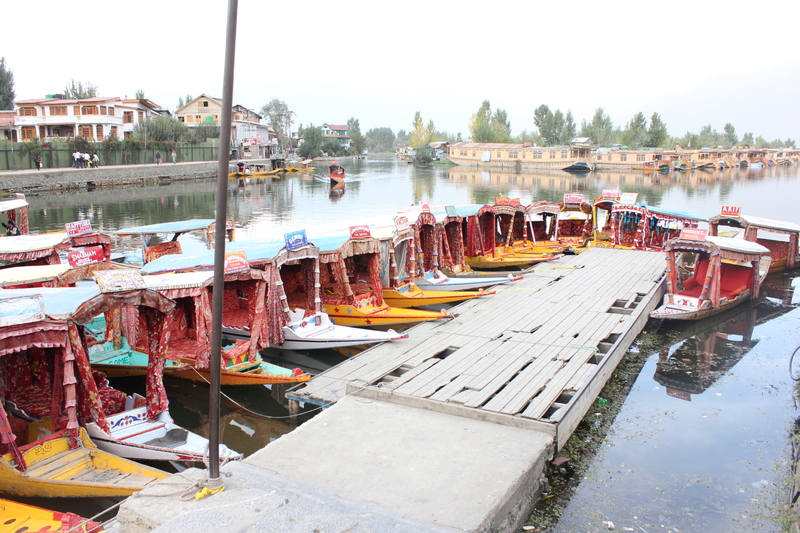 There is even a floating bazaar with one or the other canoe laden with wares vying to lodge itself adjacent to the shikara you are in and tirelessly trying to get you to loosen your purse strings. It’s annoying if you’re more inclined to just float uninterrupted. Loads of money had been sanctioned for cleaning up the Lake, the boatman said but nothing was really being done. We heard the same from others too. We later saw the dredging machines at various places in the waters, standing still and inactive . They had all been imported from abroad , we were told. But the Lake is still dirty. Nigin Lake , which we visited on a subsequent day was much cleaner and more peaceful in comparison. 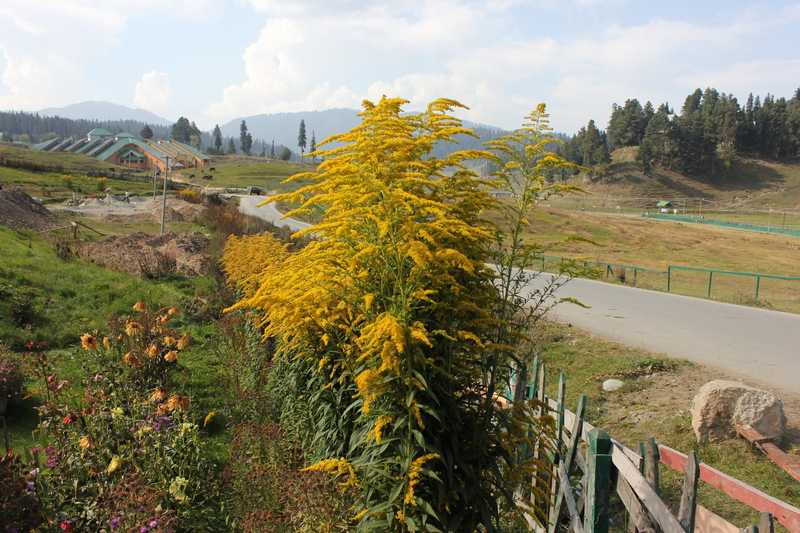 Kashmir is certainly a place one should visit in different seasons. This same place, in Winter would be covered in snow and the temple in the middle of the meadows would then then be visible only by its tip. The snow covered meadows then made for excellent skiing slopes , which had its own thrill ,as Vijaya,my friend vouchsafes. She’s been here three or four times for skiing courses. The Indian Institute of Mountaineering conducts courses stretching over two weeks, every winter at comparatively reasonable rates. It’s a whole package , which includes boarding and lodging and the instruments. Earlier the participants used to be put up at one or more hotels there, Now the Institute has a nice big building of its own, overlooking the slopes. This year there had been a good inflow of tourists and we were happy to see the normalcy of life , unhindered by the strife of the past 20-25 years. 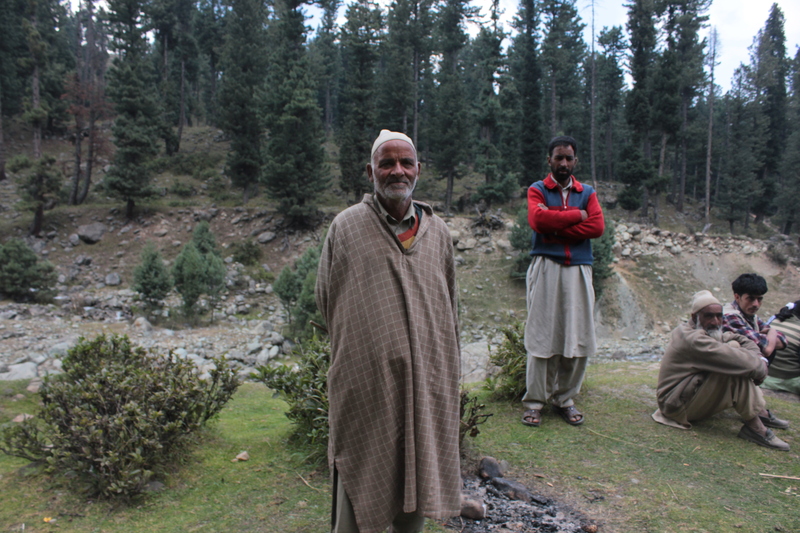 Majidbhai , in whose vehicle we did most of the travelling ,told us ruefully that the period of violence had put back the state by a hundred years. The general refrain was that the politicians were singularly responsible for the whole mess and that the militancy could have been contained and order restored if they really meant business. They spoke of a coalescence of corruption and a strong nexus of vested interests both amongst politicians and some from the security forces , that actually allowed the flow of men and arms across the borders , perpetuating a prolonged period of unrest . There was a lot of business too being carried out under the cover of the disturbances. Large areas of forests had been cut down for the timber which left the state to line the pockets of those in the loop with easy cash, it was said. Funds released by the Central Government never reached the intended beneficiaries and were being regularly siphoned off and all the while the common man bore the brunt, caught in the crossfire between the militants and the security forces. 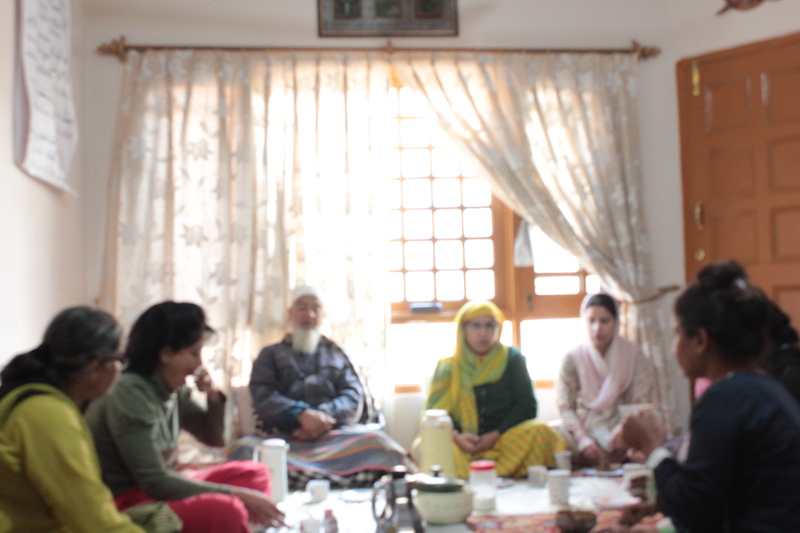 In Srinagar , we stayed with Mir Sir’s family. He had retired as the head of the Indian Mountaineering and Skiing Institute . Vijaya , who had done the course several times , was by now a close family friend and by vitue of being her friends, we were extended the same warm welcome. Qiyaan , Mirsaab’s little grandson was a real charmer and we were literally on our knees trying to woo him from the word Go!.When we arrived at their house after our stay at Gulmarg, Mrs. Mir and her daughters Aneesa and Hadiqa hugged us with a warmth that radiated so much of genuine affection. We got addicted to the ambience of that household, the delicious food and the kashmiri kehwa that Mrs. Mir brewed for us from time to time. We also visited the Hazratbal shrine one morning and the Nishat Bagh the same evening. 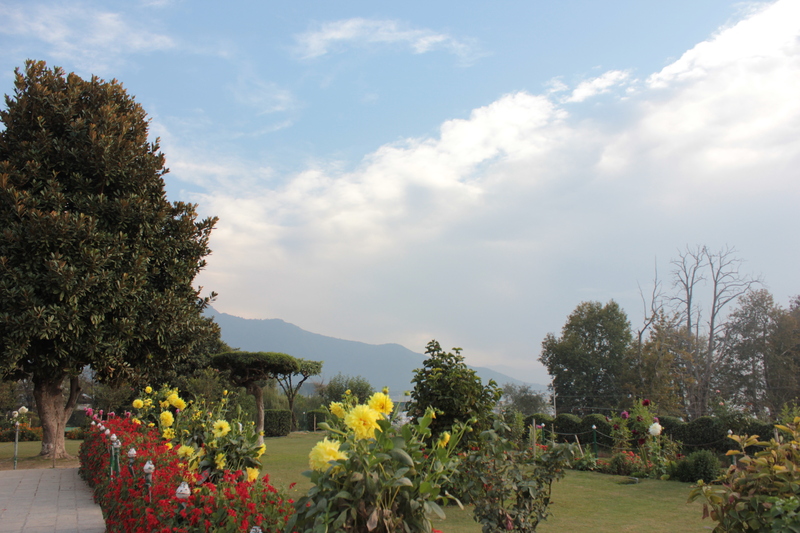 The terraced gardens were a riot of colours amidst the chinar trees. 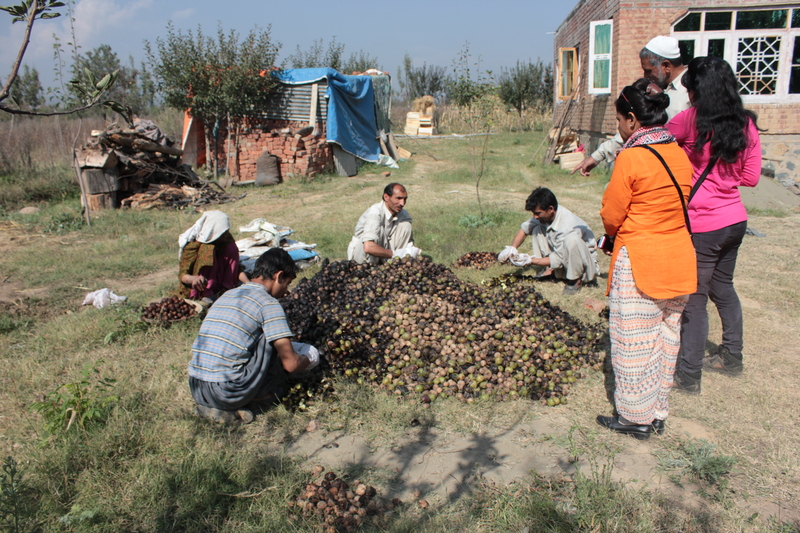 The evening sauntered slowly into the hours of dusk and the sunset in the waters of the Dal Lake was a like a visual treat staged specially for us , to wind up the day.
. We passed by apple and walnut orchards, stopping to pick up a few freshly fallen fruits from below the trees and to watch the walnuts being removed from its pulpy rind. Those at work had covered their hands with polythene because the skin had turned black after being soaked in water and would leave stains. 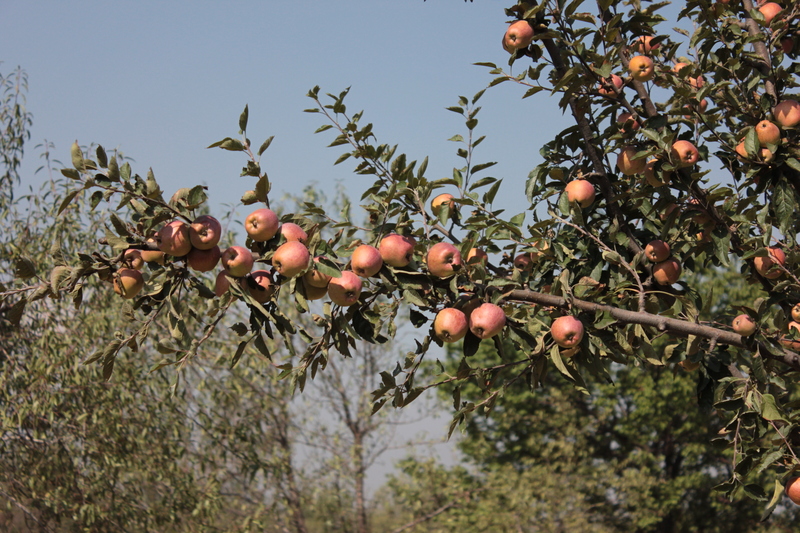 The skin is used by many , adding it to Mehndi to make a natural dye. 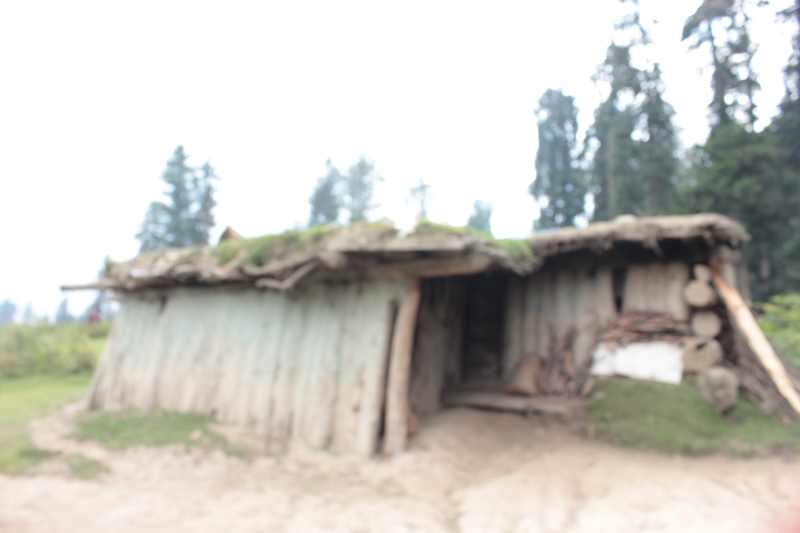 Up in the slopy meadows of Yusmarg, where the ranges stood as sentinels all around, there were small huts where the shepherds lived. These were not the nomads, who were identified by the ownership of horses, which were used by them to carry their belongings and women and children from one place to another. The huts belonged to those who had their permanent dwellings in the villages at lower altitudes, where they had cultivation of their own. They came up to the mountains in Summer to allow their flocks to graze on the rich grass of the meadows. 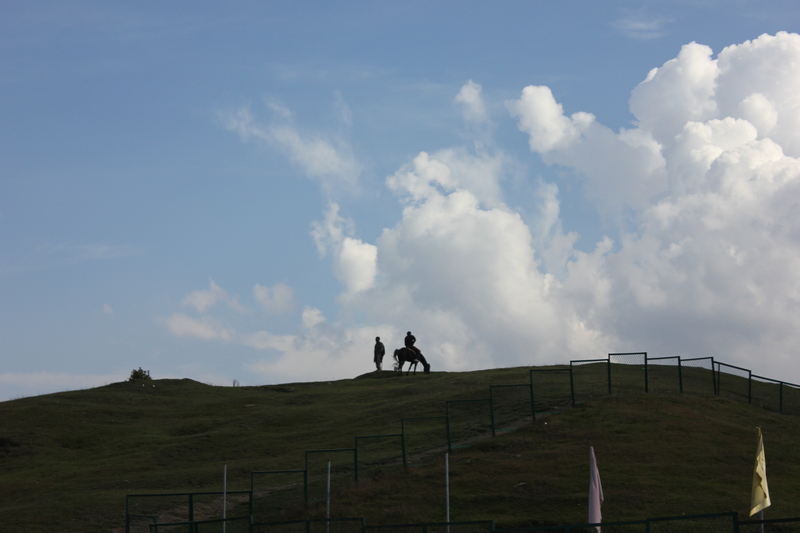 At all these places, young and old men with ponies pestered us to let them take us to some viewpoint or another. 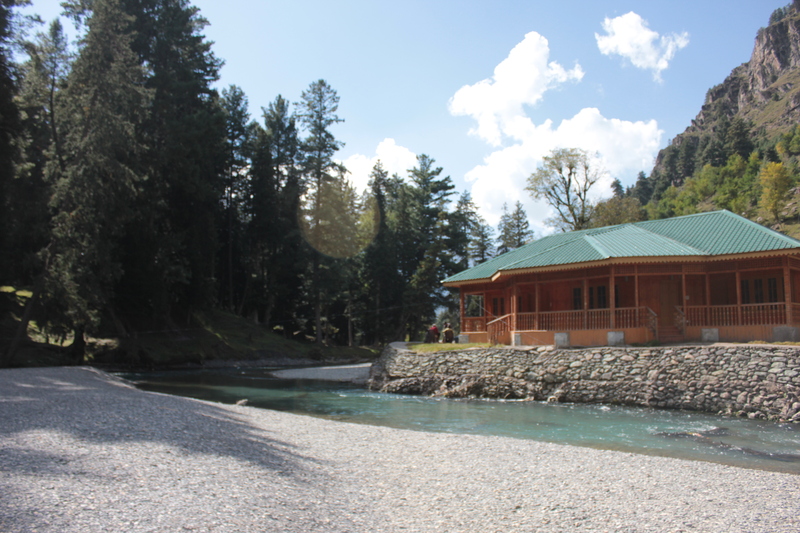 Here at Yusmarg, Doodhsagar was supposed to be one such. I got persuaded, I must admit . 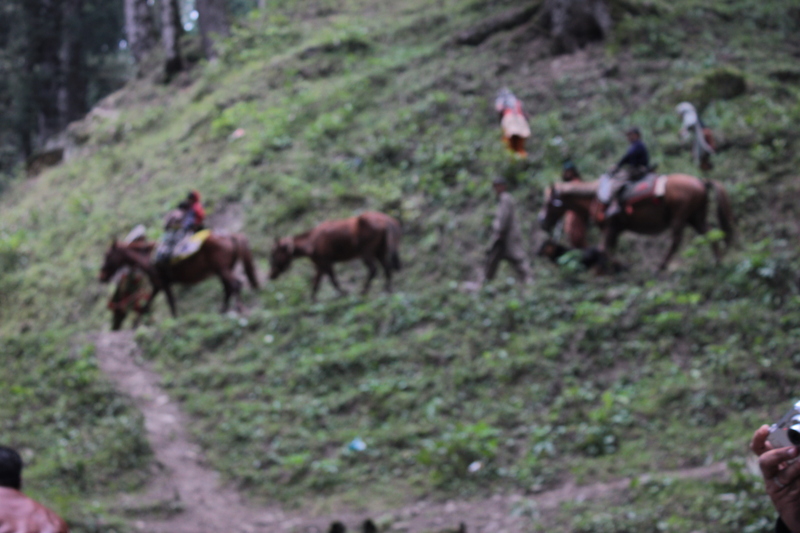 Sitting aloft the pony, chatting to Firdaus the young boy and making our way through the narrow track on the slopes was fun. 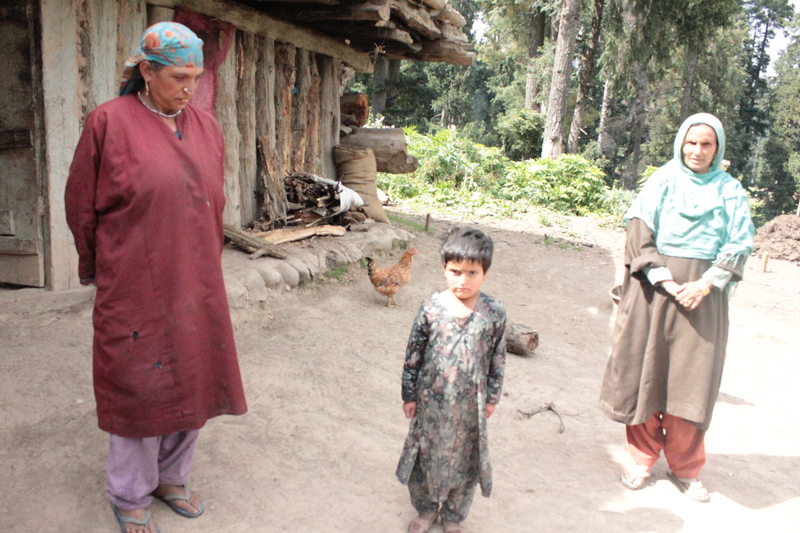 Firdaus had never gone to school. During the tourist season , he tried to make as much money as he could by way of the commission he got from the pony owners for escorting them on their sightseeing trips. He also helped with the cultivation on the little patch of land they owned. His parents were too old to do any work and he was the bread winner now. Less than eighteen, Firdaus was already a mature man. Doodhsagar was a disappointment, being just a thin stream over the rocky bed . A dam built upstream was the reason, they said. But when the snows melted in Summer, the waters would be gushing and roaring making it difficult to cross at any point. While returning , there was a whole group of nomads on their migratory trail, about whom one had just read about here and there. Witnessing them first hand was a really interesting experience. 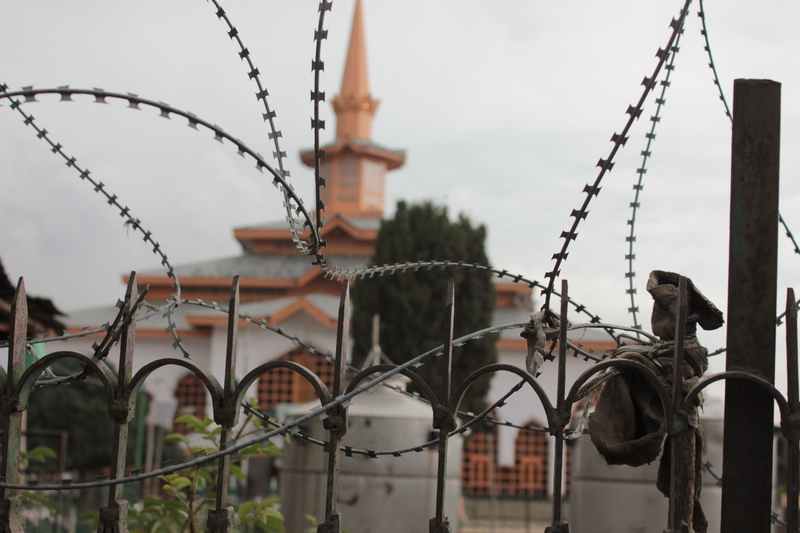 On the way back to Srinagar we visited the newly built Chirar-e-Shareif mosque. The old structure had been burnt down in the confrontation between the militants who had been holed up there and the security personnel. The militants had managed to escape, which was surprising Majidbhai said , as the area was not large and had been cordoned off. Far removed from the happenings in time and space, it was not for us to glean through the various versions, but yes, nothing was as straightforward as made out to be , it appeared. Friendships nurtured by Vijaya from her skiing days at Gulmarg, made for another interesting visit, this time to Manasbal. 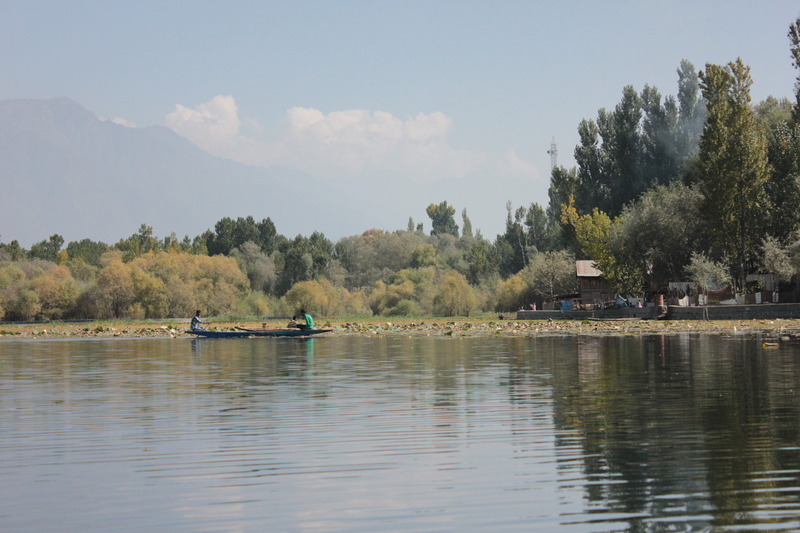 It is considered to be one of the deepest lakes in Kashmir (about 13 metres). 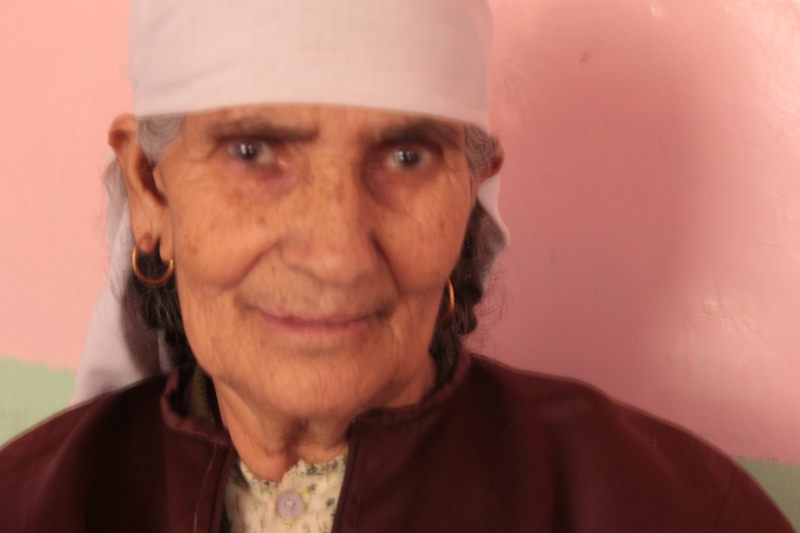 Khursheid, lived in one of the villages bordering the lake. He met us with his little cute daughter, Ikra , who thenceforth became absorbed with a lollipop and wouldn’t answer any of our questions. “Pestering females”, she must have been thinking. 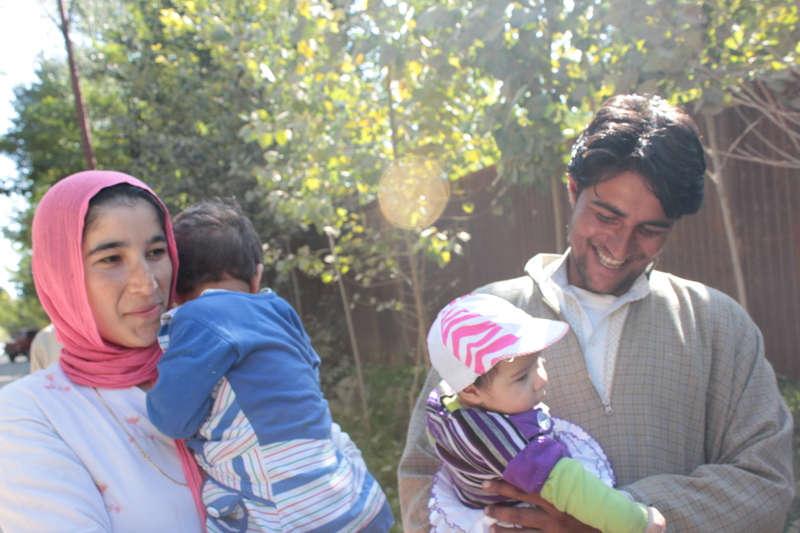 Khursheid was just around twenty four , but already a father of two. His wife wasn’t at home. It was only later that we learnt that the reason for her stay at her mother’s place was the arrival of the second kiddo. We met them both on our way back, as their place was not far away. 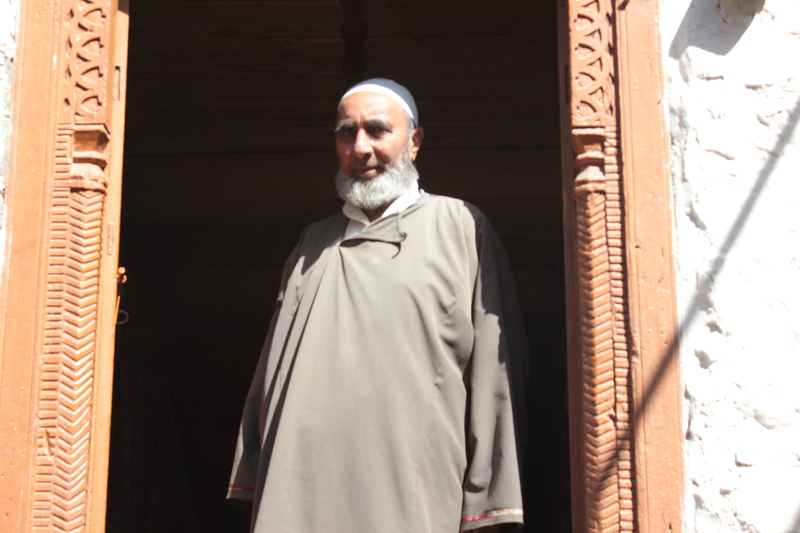 We made our way in a shikara to Khursheid’s sixty year old house, escorted by him. 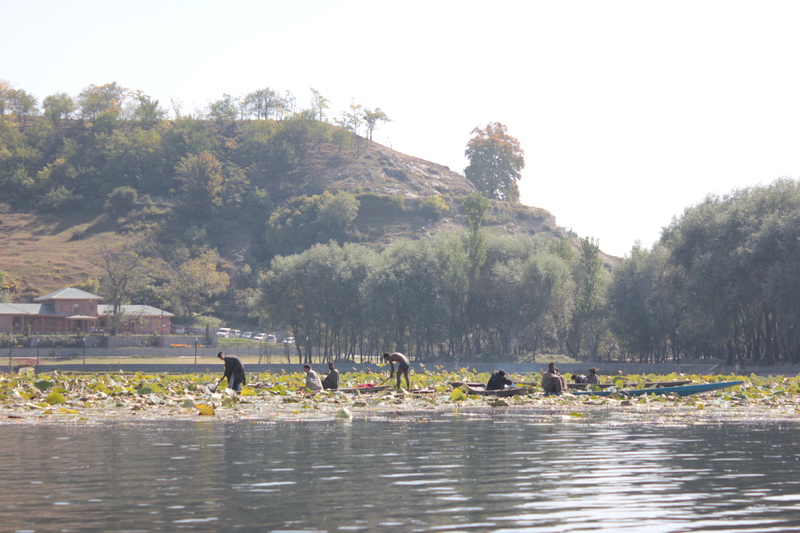 On one side of the lake, lotus plants grew in plenty and there were quite a few men in small canoes, collecting the rhizomes of the plants(Kamal kakkidi ) from under the water surface. We were familiar with it in Delhi , as they were sold in the markets . But by the time they arrived there they would be brown and hard. 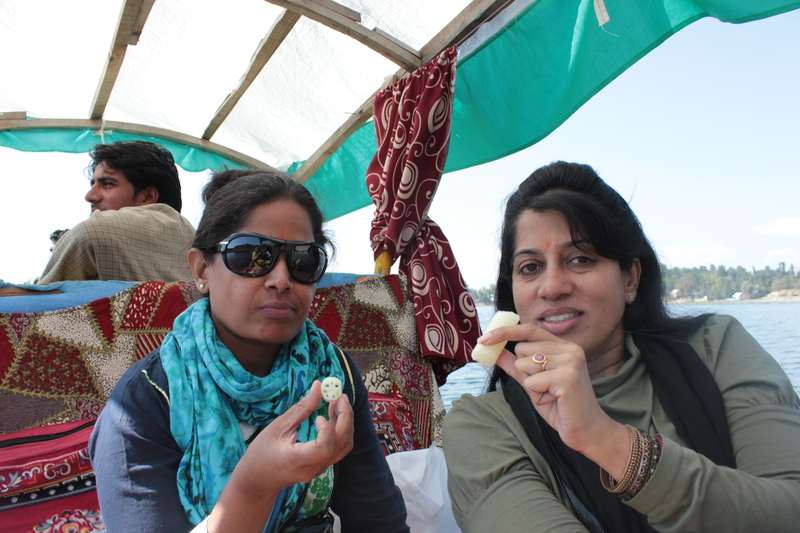 Here, freshly collected, they were white and crunchily soft and a little sweet and we bit into the pieces offered to us. The fibrous stalks are said to be good for health, being a rich source of Vitamin C and minerals , besides adding a lot of fibre to the diet. It is said to reduce blood cholesterol, sugar, body weight and constipation. 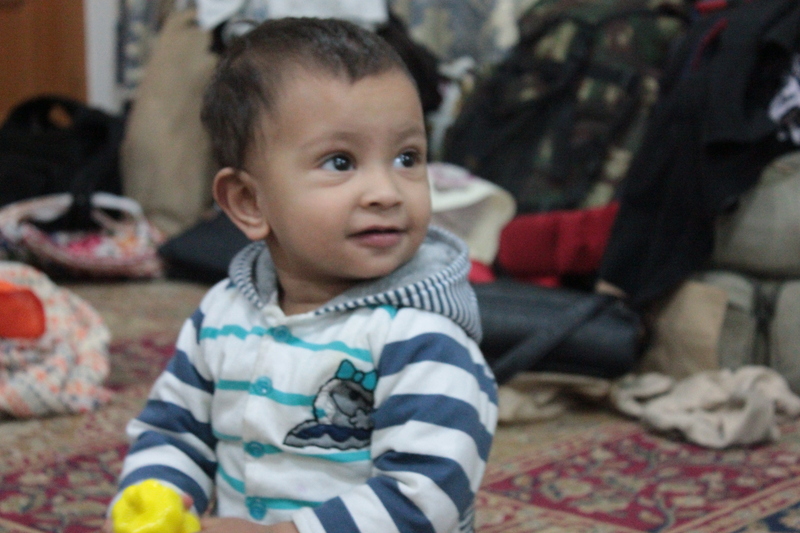 We met Khursheid’s parents, His mother was a sweet old lady, dressed in the typical Kashmiri phiran, with a scarf covering her hair. She had her hair tied in two neat plaits which gave her a very endearing demeanor. She didn’t know any hindi , so our conversation was limited to smiles. 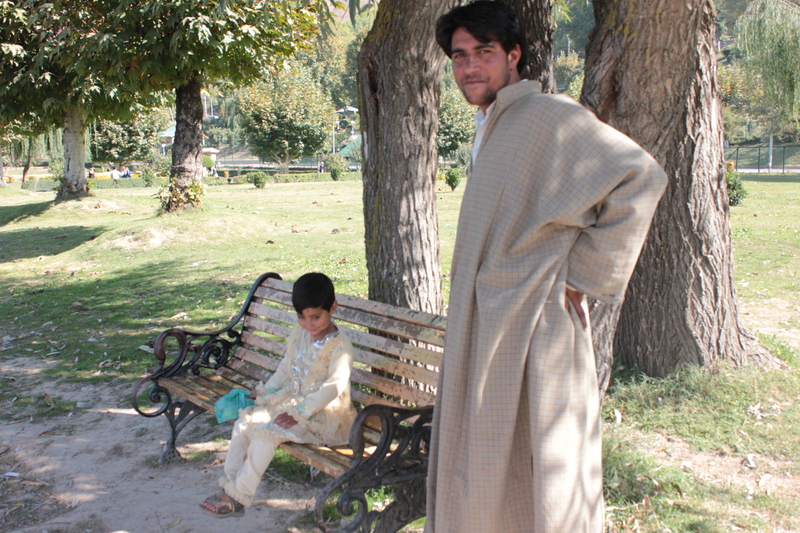 Khursheid’s father was a retired school master. He came across as someone full of integrity and courage. He told us of the times when militants roamed the area and of a night when they had barged in demanding food to be cooked. This was the story we heard from many others. Very few had the courage to refuse. Later the security personnel would be at their backs , accusing them of sheltering the insurgents. Khursheid’s father had dared to give them a piece of his mind and one of them responded by sticking the gun to his chest. It was only the entreaties of his wife that saved him that day. As was expected, he had to make several trips to the authorities before they absolved him from involvement with the jihadis. Not just that, when one of the militant leaders operating in that area was later killed in an ambush, the word went around in their circles that he had been responsible for the attack as he had leaked information to the police. But he was apparently a man who had garnered a lot of respect in those areas and eventually he was let alone by both sides. He had strong words for both the leaders of the militant groups as well as for the Government in place. All interested in looking after their selfish interests, he said. He seemed to be an interesting individual in more ways than one. Some time ago, he had been diagnosed with cancer and was to undergo surgery. Then on the night of Shabbe-baaraat, he had sat up the whole night praying . Next morning he declared that he was feeling perfectly fine. A subsequent check up revealed that there were no signs of any cancerous growth. An erroneous initial diagnosis or a miracle of faith ? Who knows?
. The soft sun sending its warm rays from blue skies, the play of light and shadows amongst the trees that grew on the banks of the River Lidder, the green roofed cabins dotting the slopes, the blue and grey and brown of the mountain ranges, all combined to spread out vistas of beauty before our eyes. Later in the day we went to the Aru valley also beautiful. The landscape is the same..mountains, meadows, streams, winding roads,chinars and poplars , blue skies with white candy clouds , grazing sheep and so on. But each part of Kashmir presented new angles to this combination. The return ride to Udhampur, thankfully didn’t take us as long as on our first day. We didn’t linger long to have lunch or make other stops except one, where we watched “kangris” being made from reeds gathered from the forest. These stoked with small lumps of burning coal and held close to the body , below the loosely hanging overcoats(phirans) ,were used in Kashmir as personal heaters, We bought a couple of small ones as mementos of the trip. We had taken a shared vehicle on the return trip. 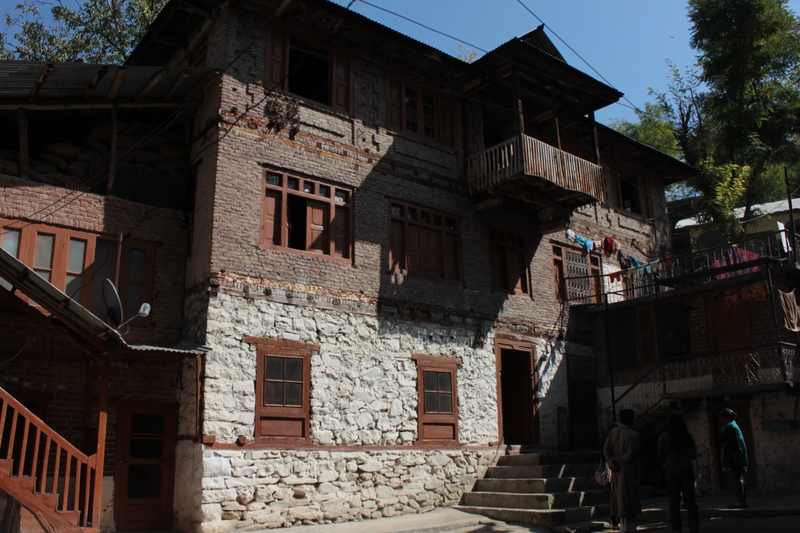 All through the trip we had heard voices that bemoaned the years of strife and blamed the fleeing of the Hindu Pandits from the valley on the authorities that were in power at that time. Now we listened to another voice, that which spoke of the disgruntlement of the muslim populace who were backward in education and thereby denied of opportunities in Government jobs and other avenues for advancement. They spoke of instances when they were suppressed and insulted. This was what made many of the youngsters be swayed by the rhetoric of salvation fed to them by the Mujahideen and others. Here was a voice which still spoke of “Hindustan” as another entity , which had not bothered to quell the disgruntlement or improve the prospect of the muslim populace by way of developmental projects and education and jobs. This was a voice which still carried whiffs of animosity , although the whole dialogue was laced with relief that things were changing for the better. There would be many versions to the stories about Kashmir. 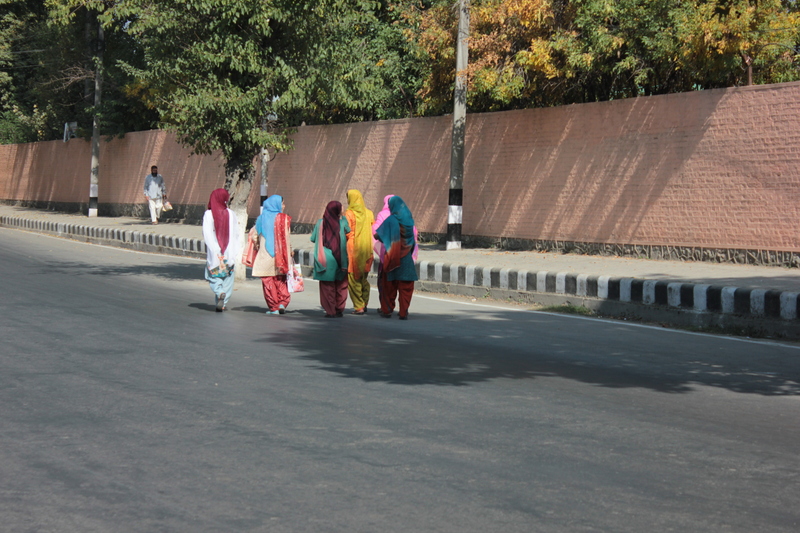 We, a group of women, three of them young, were impressed by the fact that there was no sign of dis-respect or eve teasing or commenting from the males on the streets. The girls seemed to go around with confidence and freedom. They all wore head scarfs. Only a few wore the burqah and my word!…they were so beautiful. Their faces reflected the same serenity that one sees in the people living in other mountain landscapes elsewhere in North India and that one found very surprising considering the fact that they had gone through such disturbed times of fear and insecurity , threat and loss of loved ones . I have a lot of stubbornness in me and it is not easily that I surrender my optimism . I choose to believe that this wonderful place with its wonderful people have suffered long enough and that the rays of peace are falling soft and warm on the mountains and the valleys , just like the Autumn sun that blessed us on our way through it. Oh Nadira, I just loved being taken along with you upon your journey, I so enjoyed how you weaved your travels around your photo’s. That gentleman who sat up all one night praying and his Cancer disappeared I do believe so much in ‘Self Healing’ mind over matter has the ability to change the very molecules/cells of our body .. I know of one lady who cured her eyesight and was able to see perfectly well again after wearing strong lens glasses since starting school.. Every thing is possible given we believe within and have that faith we can be healed. I hope that you are well and apologies for not getting around to visit as often as I should.. I really love your photos, I do wish that they were a bit larger … I have old eyes and do not see as well as I did once. Very lucid descriptions..and the pic are so natural, very lovely reading… It made my morning enjoyable and i feel refreshed! 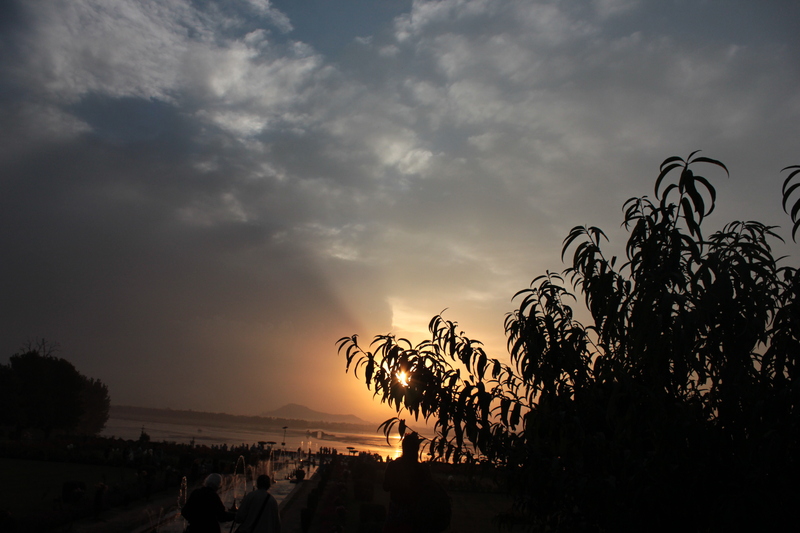 Wish to visit Kashmir some day.. a long pending desire. If the desire is strong enough, things happen, I ‘ve realised. So I’m sure you’ll find yourself there. It is definitely worth a visit.